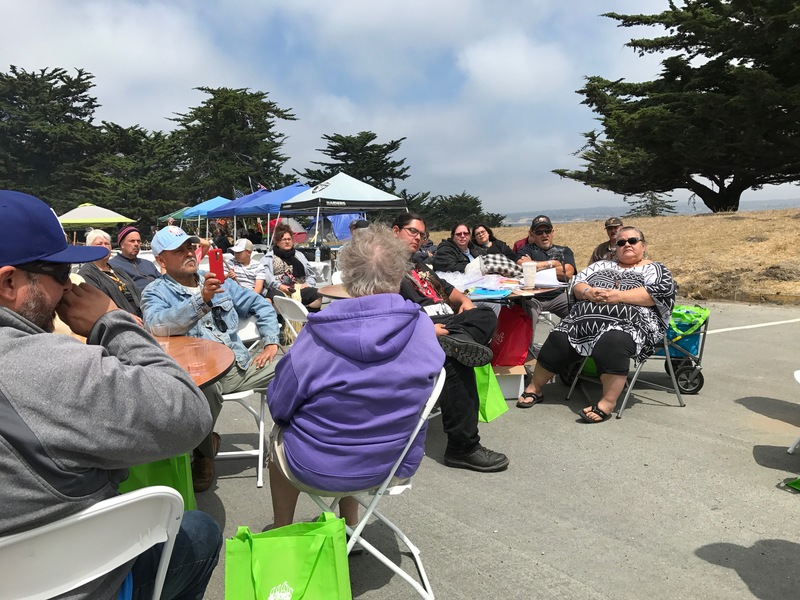 As Chairman of the Lower Presidio Historic Park Committee for the Old Monterey Foundation, I was invited to attend the Annual Gathering of the Ohlone/Costanoan-Esselen Nation (OCEN) on August 12 at the Park. The City permits this group (and only this group) to camp out at the Park for this four-day event, which is held annually. 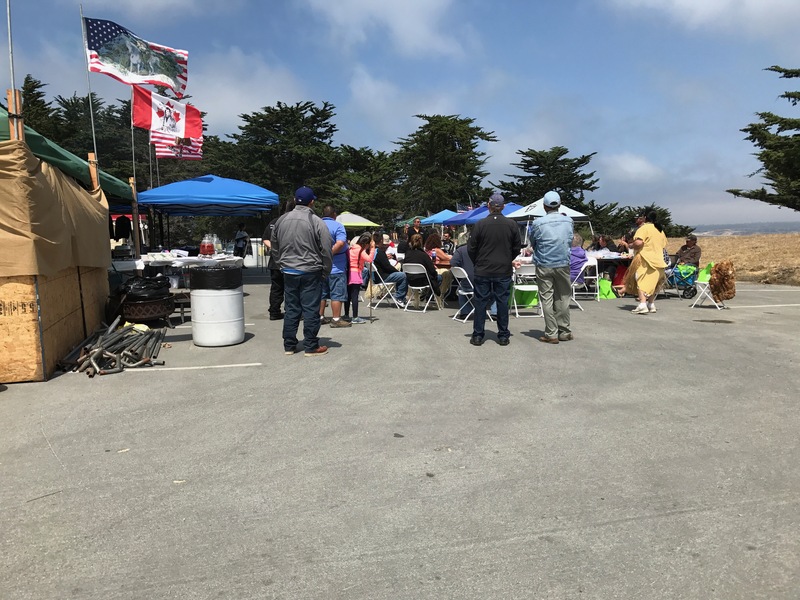 About 150 members (out of an estimated 600) were in attendance, some in traditional tribal garb, and that Saturday was the focal event of the Gathering, with tri-tip barbecue and a feast at 2 pm. I expected to simply sit at a table to pass out brochures about our Phase I Plan for the LPHP, but Louise Miranda Ramirez, Tribal Chairwoman of OCEN, introduced me to the Gathering and invited me to speak. I described our Plan and solicited questions and comments in about a 30 minute presentation. 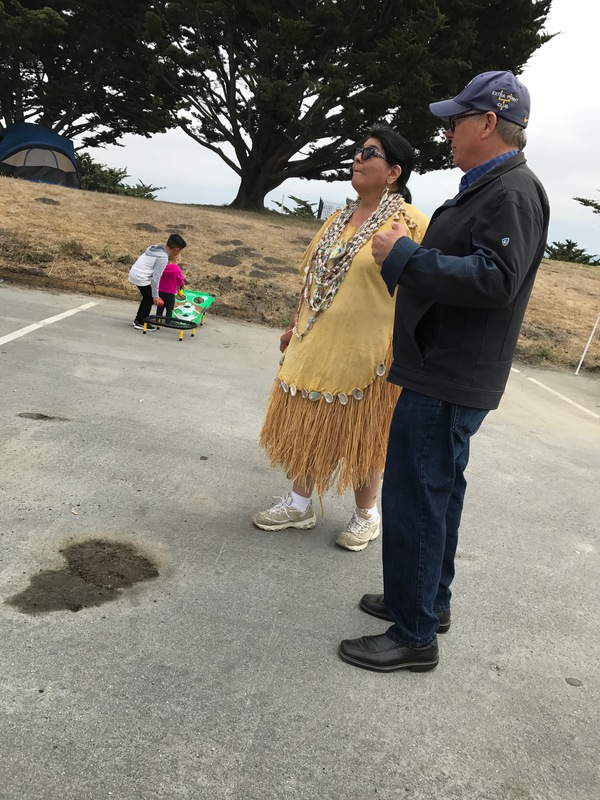 The OCEN considers the Lower Presidio to be sacred ancestral land and the comments I received were of concern that we treat the land with due respect. I described our designs for trails and signs that would not penetrate the earth or in any way disturb the evidence from the past 10,000 years which is buried in the ground at LPHP. I am pleased to report that the response from the members was positive and supportive of our efforts. We also talked about celebrating our local Native Americans at a festival to be sponsored by OMF sometime next year. It is unfortunate that our local tribes are not better known among the citizens of Monterey and Monterey County, but hopefully the work of the Old Monterey Foundation will begin to rectify that situation. They were here long before European explorers arrived and deserve proper historic recognition in our community. I was also struck by the strong sense of injustice the members feel about not being among the federally recognized tribes in California. They were once so recognized, beginning in 1883 as the San Carlos Band of Mission Indians, and later as the Monterey Band of Monterey County. The discovery in 1905 that 18 treaties between California Indians and the U.S. had never been ratified by the U.S. Senate, led to the Monterey Band being formally recognized in 1906. Unfortunately, the Monterey Band and OCEN were erroneously dropped from the list of federally recognized tribes in 1923. Compared to many other California tribes who ere compensated with land grants from the Federal Government, OCEN has only been offered the paltry sum of less than $1,000 for the loss of many million acres of land to American settlers. This injustice is still paramount in the minds of members of OCEN. I was followed in my talk by Col. Laurence Brown, Commandant of the Presidio, and then by Senator Bill Monning. Although the day was a bit chilly and overcast, a good time was had by all. For more information about OCEN, go to http://www.ohlonecostanoanesselennation.org .